ISTC uses author form: Plinius Secundus, Gaius (Pliny, the Elder). Title from incipit (p. ). Imprint from Goff. Colophon (in verse, p. ) reads: Quem modo tam rarum cupiens uix lector haber[et]: quisq[ue] etiam fractus pene legendus eram: restituit Venetis me nuper Spira Ioannes: exscripsitq[ue] libros ere notante meos. Fessa manus quondam moneo: calamusq[ue] quiescat. Nanq[ue] labor studio cessit: & ingenio. M.CCCC.LXVIIII. Leaves printed on both sides; 50-52 lines per page. Unsigned gatherings. Final leaf (p. -) blank; lacking in Dibner Library copy. Bookplate: Burndy Library … gift of Bern Dibner. Ms. provenance note at top of p. : Baccij Valorij Philippi F. [illegible]. Illuminated initials on first page; rubricated throughout in red and blue inks. Old ms. annotations throughout. Photocopy of unidentified printed description of this edition and copy laid in. Two copies of a reprinted article by Arnold C. Klebs, "Incunable editions of Pliny's Historia naturalis", from Isis, no. 67 (vol. XXIV, I), Dec. 1935, p. 120-121, laid in. Bound in gilt-ruled red morocco, preserving earlier gilt-tooled calf spine; raised bands; gilt-tooled doublures; marbled endpapers; all edges gilt. In modern box. Title: Historia naturale / di. C. Plinio Secondo ; tradocta di lingua Latina in Fiorentina per Christophoro Landino Fiorentino al Serenissimo Fernando re di Napoli. Imprint: Venice: Opus Nicolai Iansonis Gallici, impressum anno salutis 1476. Comments and Notes: ISTC uses author form: Plinius Secundus, Gaius (Pliny, the Elder). First Italian edition. Caption title, from incipit (p. ). Imprint from colophon (p. ). The first and last leaves are blank; both are lacking in Dibner Library copy. Leaves printed on both sides; 50 lines per page; unsigned gatherings. Guide letters. Bookplate: Burndy Library ... gift of Bern Dibner. Old ms. annotations; some affected by cropped margins. Dibner Library copy has none of the variant readings listed in Hain for this edition. Imperfect: Pages - removed from Dibner Library copy; these severely trimmed pages, with much loss of text, have been laid in. The last 50 pages or so of text are water damaged and have been badly repaired, affecting text in places. Two short printed articles about this edition have been laid in; a typed exhibit card from Brandeis University and a pencilled note on the "mandragora" also laid in. Modern binding of embossed full leather; gilt- and black-stamped covers and spine; marbled endpapers; top edge gilt. Binder's title reads: Plinii Historia naturale. Jenson sent 24 copies to the commissioner Giambattista Ridolfi about the beginning of June 1476; Ridolfi had received 1003 copies (of the 1025 to be printed, each to be sold at seven ducats) by 20 Sept. See F. Edler de Roover in La Bibliofilia, 55 (1953), 110-11. Comments and Notes: ISTC uses author form: Plinius Secundus, Gaius (Pliny, the Elder). Edited by P. Beroaldus. 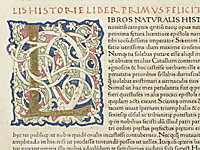 Title from colophon (leaf L8 verso), which reads: Caii Plynii Secundi Naturalis historiae libri tricesimiseptimi et ultimi finis impressi Teruisii ductu et impensis Michaelis Manzoli Parmensis. M.CCCC.LXXIX regnante serenissimo Venetiarum duce Ioanne Moncenigho octauo Kalendas Septembris. Incipit (leaf a2 recto) reads: Hieronymi Bononii Taruisani ad Ioannem Bombenum amicorum optimum pro C. Plinio Secondo Apologia. Imprint from Goff; poem on leaf a3 verso is also dated at end: Taruisii tertio idus Octobres MCCCCLXXIX. Signatures: a14 b8 c-h10 i12 k-p10 q8 r-z10 &10 [con]10 [rum]10 A10 B6 C-D10 E-I8 K10 L8 M4. Leaves printed on both sides; 50 lines per page. Guide letters; catchwords at end of signatures, except a, b, e, h, y, z. First and last leaves (a1 and M4) are blank. About two lines of text have been omitted at the end of signature z. "Ad uenerabilem & ornatissimum uirum Nicolaum Rauacaldum ... Philippi Broaldi [i.e. Beroaldi] Bononiensis Epistola"--Leaves L8 verso-M3 recto. Extensive old ms. annotations in ink. Bookplate: Burndy Library ... gift of Bern Dibner. Two anonymous typed descriptions of this ed. and copy ( p. each) are laid in. Bound in old blind panel-stamped full leather over wooden boards; old vellum manuscript waste (music and text) used for front and back free endpapers; metal clasps and bosses (mostly lacking); rebacked. Title: Libro primo [-ultimo] della Naturale historia / di C. Plinio Secondo ; tradocta i[n] lingua Fiorentina per Cristophoro Landino Fiorentino al Serenissimo Ferdinando Re di Napoli. Comments and Notes: ISTC uses author form: Plinius Secundus, Gaius (Pliny, the Elder). Title from incipit (leaf a2 recto). Imprint from Goff. Colophon (leaf K8 verso) reads: Opus Magistri Philippi Veneti impressum anno salutis M.cccclxxxi. Venetiis. Signatures: a8 b6 2a-2b8 c-h8 i-o6 p8 q10 r-z8 [et]8 [con]8 [rum]8 A-I8 K10. Errors in signatures. Leaves a1, b6 and K10 are probably blank; each lacking in Dibner Library copy. Leaves printed on both sides; 58-59 lines per page. Text in double columns. Guide letters. Illuminated initial on leaf a2 recto. Some ms. annotations in ink. Bookplate: Burndy Library ... gift of Bern Dibner. Anonymous bookseller's catalogue description of this edition (and possibly copy) has been tipped in on front free endpaper. Illegible provenance ms. note on front free endpaper. Bound in quarter-vellum over blue paste-paper boards; gilt tooled binder's label which reads: Plinius Secundus. Naturale historia. Comments and Notes: ISTC does not list this in the Dibner Library. ISTC uses author form: Plinius Secundus, Gaius (Pliny, the Elder). Title from colophon (leaf I7 verso), which reads: Caii Plynii Secundi Naturalis hystoriae liber trigesimus septimus & ultimus finit. Venetiis impressus op[er]a & impe[n]sa Rainaldi d[e] Nouimagio Alamani anno natiuitatis Domini. M.CCCC.LXXXIII. Die sexta mensis Iunii. Regnante illustrissimo principe Ioanni Mocenigo. Imprint from Goff. Philippus Beroaldus named as editor in Goff. Incipit (leaf 2a2 recto) reads: Caius Plinius Marco suo salutem. Signatures: 2a8 2b10 a-r10 [long s]10 s-z10 &8 [con]8 [rum]8 A-H8 I10. Leaf 2a1 (first leaf) blank; lacking in Dibner Library copy. Leaves printed on both sides; 49 lines per page. Guide letters. "Correctiones"--Leaves I8 recto-I9 verso. Register on leaf I10 recto. Leaf n2 misbound immediately following leaf n3. Bookplate: Burndy Library ... gift of Bern Dibner. Bound in half-vellum over marbled boards; gilt-tooled binder's label which reads: Plinius. Naturalis historia. Venetiis 1483. Illegible provenance ms. note at head of leaf 2a2 recto; partially erased. Comments and Notes: ISTC uses author form: Plinius Secundus, Gaius (Pliny, the Elder). Title from incipit (leaf 2a2 recto). "Caii Plinii Secundi Naturalis historiae liber ..."--Leaf 2a3 recto, line 7. Imprint from Goff. Signatures: 2a-2b8 a-d8 [cursive d]8 e6 f-z8 &8 [con]8 [rum]8 A-I8 2I6. Leaf 2a1 is blank? ; lacking in Dibner Library copy. Leaves printed on both sides; 53-54 lines per page. Guide letters. Imperfect copy: Leaves 2a2-2a8 and 2b1-2b2 are lacking and have been replaced by old ms. text pages in ink; leaf x4 is misbound immediately before leaf x3; the bottom third of leaf 2I6, including colophon [? ], has been torn out and replaced with a blank piece of paper. Ms. annotations (some affected by cropped margins). Bookplate: Burndy Library ... gift of Bern Dibner. Illegible ms. provenance note on leaf 2I6 recto. Bound in old full vellum over paper boards; blue sprinkled edges; title inked on spine. Title: De naturali hystoria : diligentissime castigatus / C. Plynius Secundus. Comments and Notes: ISTC uses author form: Plinius Secundus, Gaius (Pliny, the Elder). Reprinted from the Britannicus edition of 20 Apr. 1496, Goff P797 (BMC). On title page, author's name precedes the title. Imprint from Goff. Colophon (leaf D9 verso) reads: Caii Plynii Secundi De naturali hystoria opus foeliciter absolutum est: qua[m] diligentissimae castigatum: imp[re]ssum Venetiis accuratissime p[er] Bartolameu[m] de Za[n]nis de Portesio a[n]no n[ost]ri Saluatoris. M.cccclxxxxvi. die xii mensis Dece[m]bris. Signatures: a6 b-z8 &8 [con]8 [rum]8 A-C8 D10. Final leaf (D10) is blank; lacking in Dibner Library copy. Leaves printed on both sides; 62 lines per page. Initials; guide letters. Corrections and annotations in ink; some affected by cropped margins. Bookplate: Burndy Library ... gift of Bern Dibner. Ms. provenance note at top of leaf a2 recto, which reads: Emptus fuit liber iste a me Fra[tre?] Cesare de Sa[n? ]this ... d[omi]no Gulielmo Magnino notario Verone[n]si die 19 Aprilis 1515 p[re]tio [illegible] octo. Modern binding of quarter-leather over wooden boards; gilt-tooled spine with spine title which reads: C. Plinii Historia naturalis.